Currently closed for renovations. Re-opening late 2019. 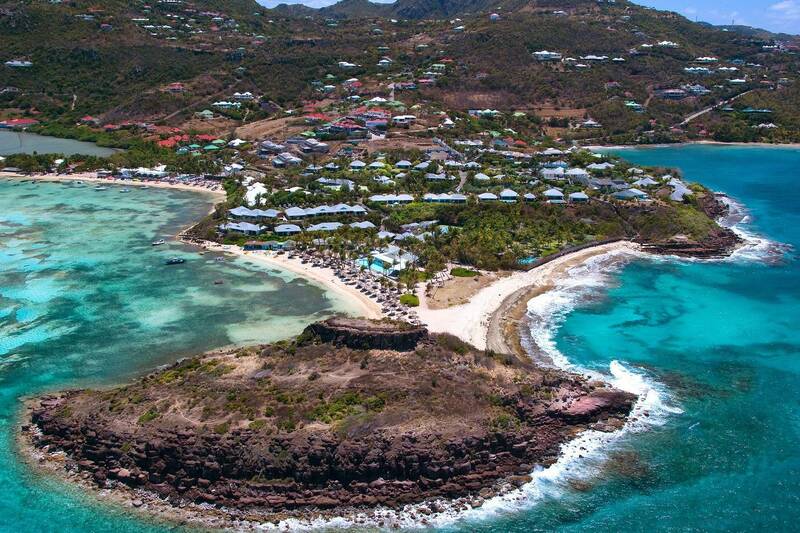 Nestled in a very private peninsula Le Guanahani is St. Barth’s largest hotel and the island’s only full-service resort. It’s a gorgeous (think hibiscus, bougainvillea and a coconut grove) 16-acre retreat. But lest you think it is too big – au contraire – there are just 67 rooms and suites housed in charming, brightly colored cottages that trail down to the two beaches. 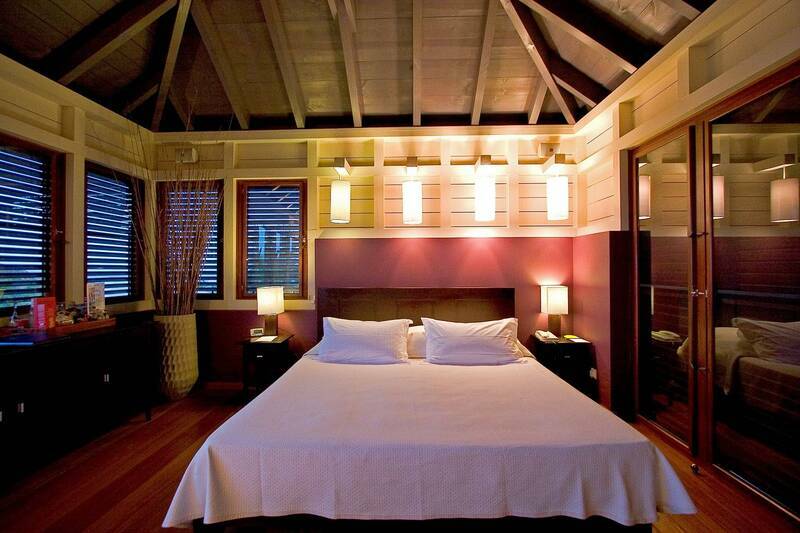 Yes, two – the ocean-side Marigot and the reef-protected Grand Cul de Sac. And there are two pools and a Jacuzzi big enough for the whole family. 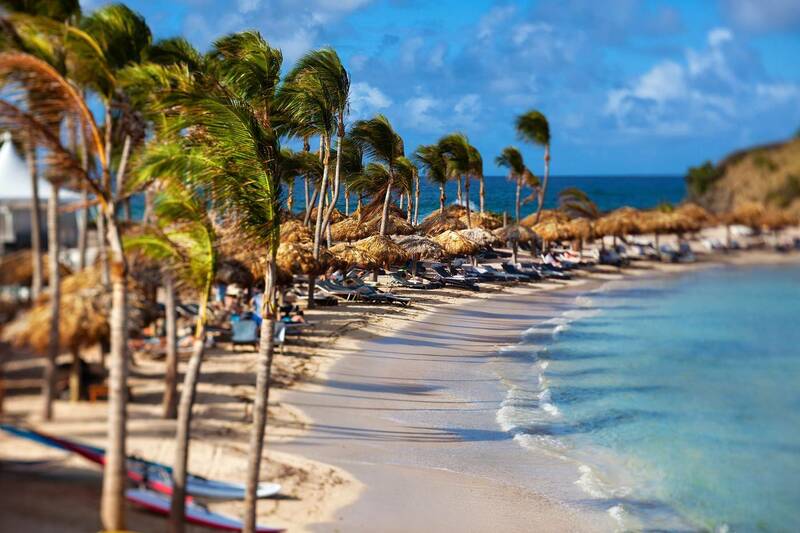 Le Guanahani with its resort’s-worth of water sports and activities, its complimentary Kid's Club, makes for the perfect family vacation spot. The colonial décor – rare woods, pastel colors and whirling ceiling fans take you back to another time. And it’s all in keeping with consummate service level offered by the gracious staff. All in all – idyllic. The range of accommodations is expansive and includes rooms, all with private terraces (several rooms have the option to connect), junior and two and three bedroom suites, many with private pools. The décor is sublime. 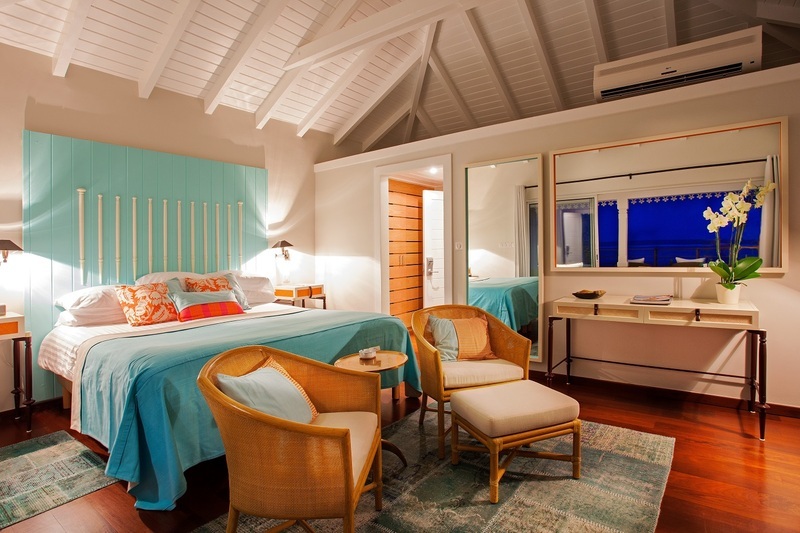 The cottages overlooking Marigot Bay feature a bold Creole contemporary look while other rooms and suites are designed by Luis Pons to invoke the journeys of colonial-era explorers. Timeless and idyllic. 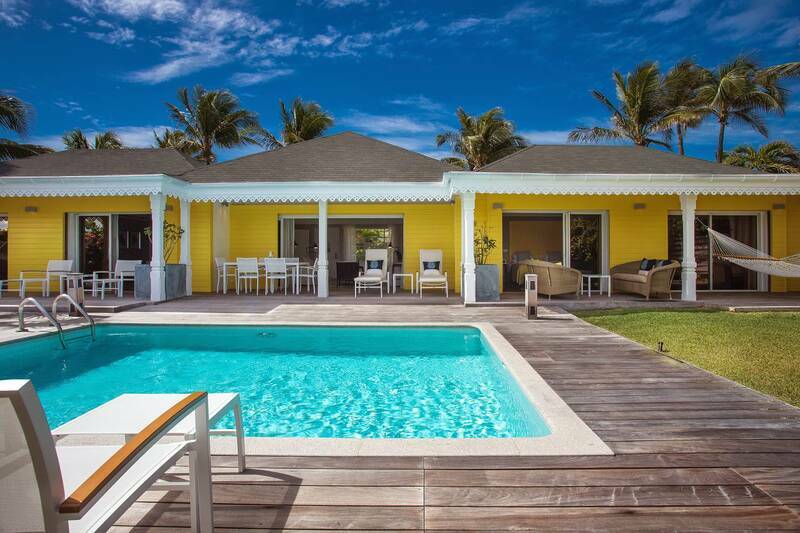 Families will love the 3 bedroom Ocean Pool Suite, the 3 bedroom La Villa and the 2 bedroom Beach House, just steps from the water with its own private garden. 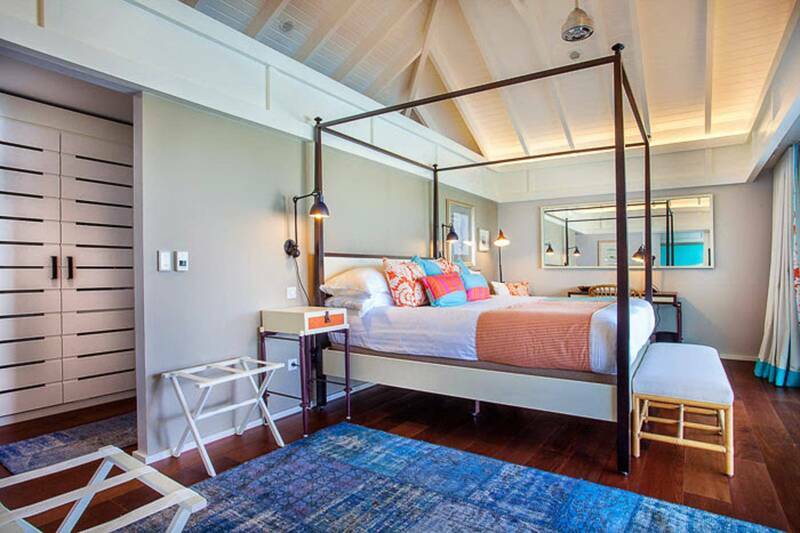 Located in the upper part of the property with views of Marigot Bay, these rooms are decorated in a contemporary Creole style and feature a king-bed, wood flooring, bathroom with shower and terrace. (385 sq ft). 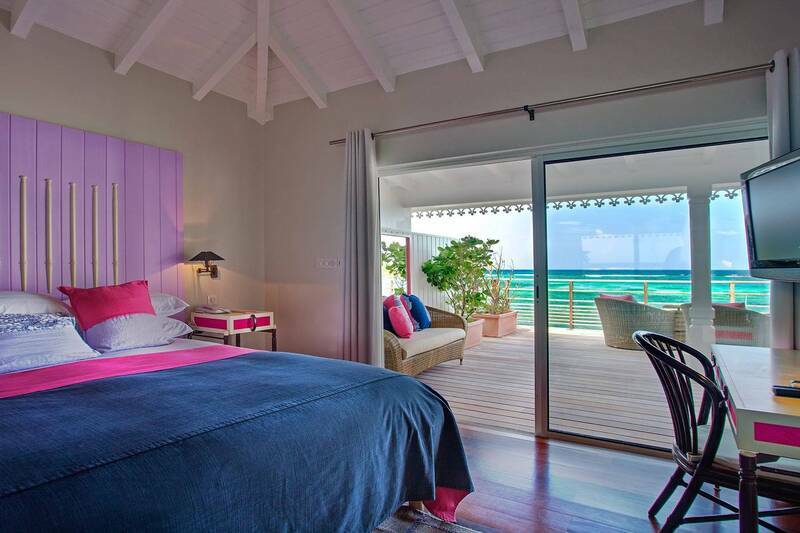 Located near Grand Cul-de-Sac, these rooms offer ocean views and are decorated in the graceful Explorer style. 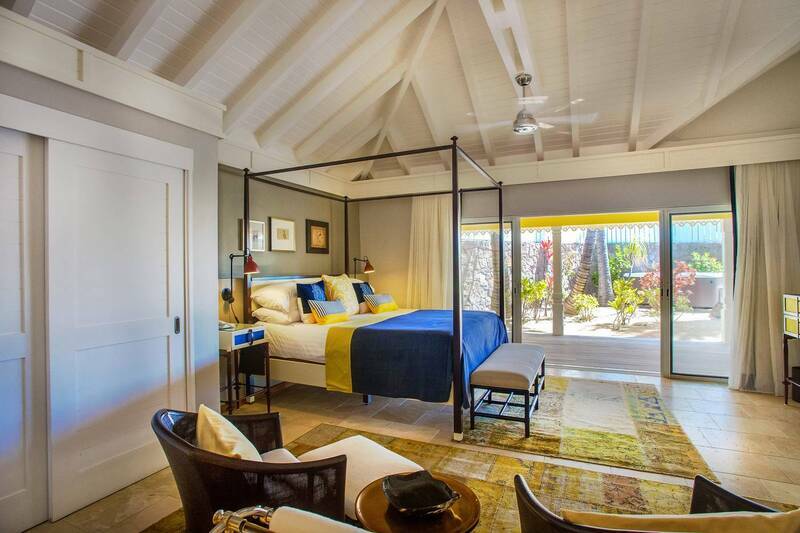 They feature a king-size bed, wood or tile flooring, bathroom with shower and covered terrace with extended sundeck. (396 sq ft). 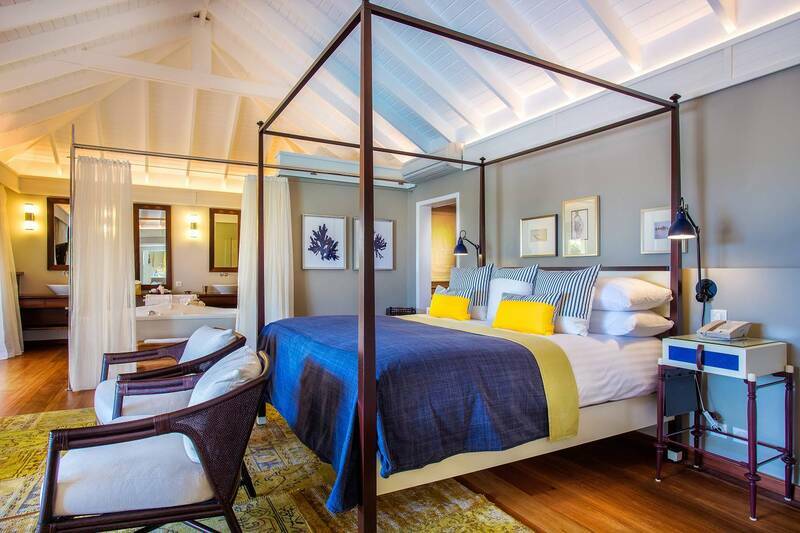 Situated on Grand Cul-de-Sac with great views of the sea, these junior suites are decorated in the graceful Explorer style and feature a four-poster, king-bedded bedroom, sitting area, wood flooring, bathroom with shower and tub, and covered terrace with extended sundeck. (505 sq ft). Placed throughout the property, these suites feature garden views, a king-bedded bedroom and separate living room with convertible sofa bed. Decorated in the graceful Explorer style, the suites offer wood flooring throughout, a bathroom with shower and covered terrace with extended sundeck. (559 sq ft). 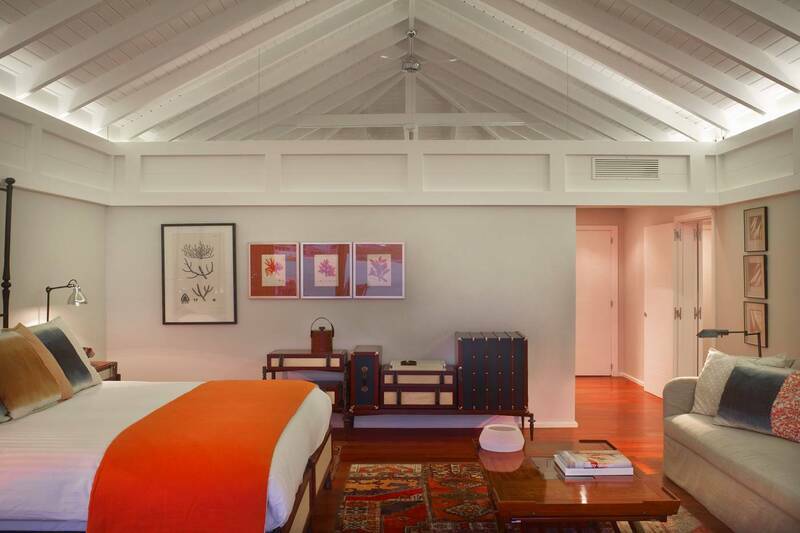 Situated in the upper part of the resort with views of the gardens, this suite features a king-bedded bedroom and separate living room with convertible sofa bed. Decorated in the graceful Explorer style, the suite offers wood flooring, a bathroom with shower, a private pool and covered terrace with extended sundeck. (628 sq ft). 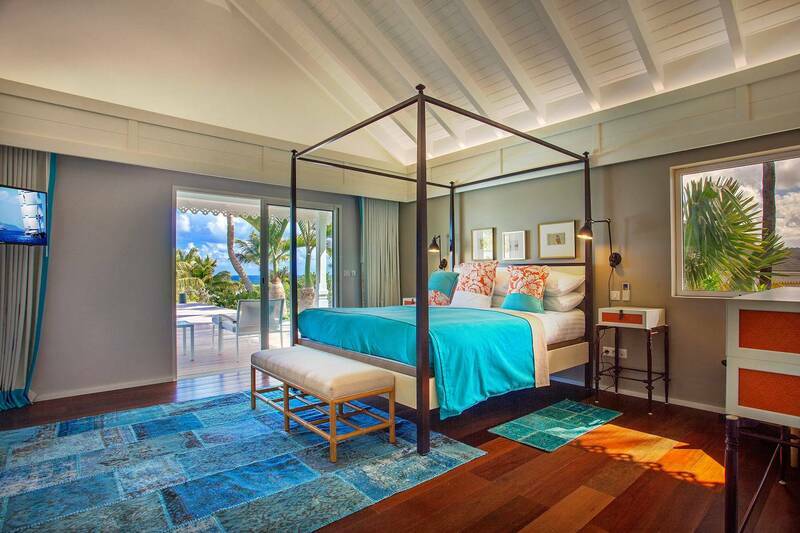 Placed throughout the property with views of the ocean, this suite features a king-bedded bedroom and separate living room with convertible sofa bed. Decorated in the graceful Explorer style, the suite offers wood flooring throughout, a bathroom with shower and covered terrace with extended sundeck. (571 sq ft). Located in upper part of the property, just above the spa, the Wellness Suite affords views of the beautiful resort grounds looking out to the sea. The loft-style mini-suite comprises one king-bedded room with wood flooring, a covered outdoor bathroom with shower and a shaded private terrace. Guests of the suite enjoy direct private access to the spa as well as unlimited exclusive use of the spa’s relaxation areas and pool after hours. (323 sq ft). 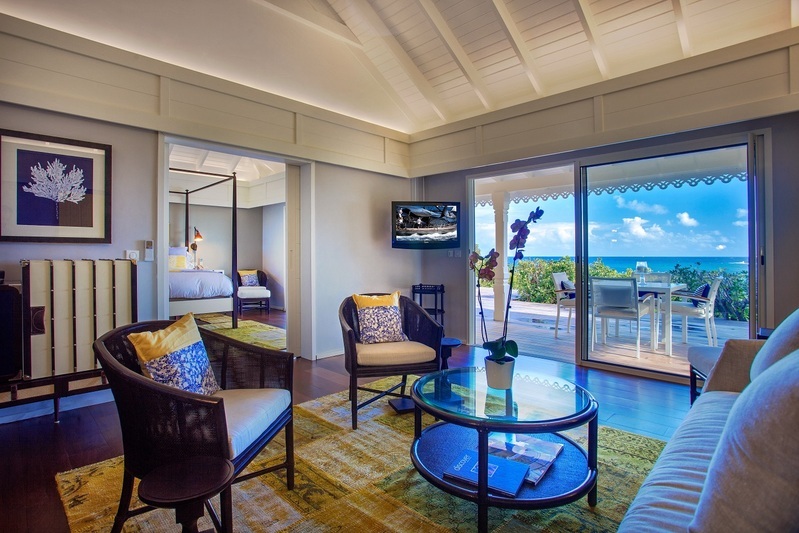 Ideal for families, this two-bedroom suite is situated in the heart of the property with views of the resort’s tropical gardens. The suite features a king-bedded master bedroom, second bedroom and separate living room with convertible sofa bed. Decorated in the graceful Explorer style, the suite offers wood flooring, bathrooms with showers, a private swimming pool and covered terrace with extended sundeck. (933 sq ft). Ideal for families, this two-bedroom suite is located in the heart of the property and offers views of the ocean. The suite features a king-bedded master bedroom, second bedroom and separate living room with convertible sofa bed. Decorated in the graceful Explorer style, the suite offers wood flooring, bathrooms with showers, a private swimming pool and covered terrace with extended sundeck. (770 sq ft). 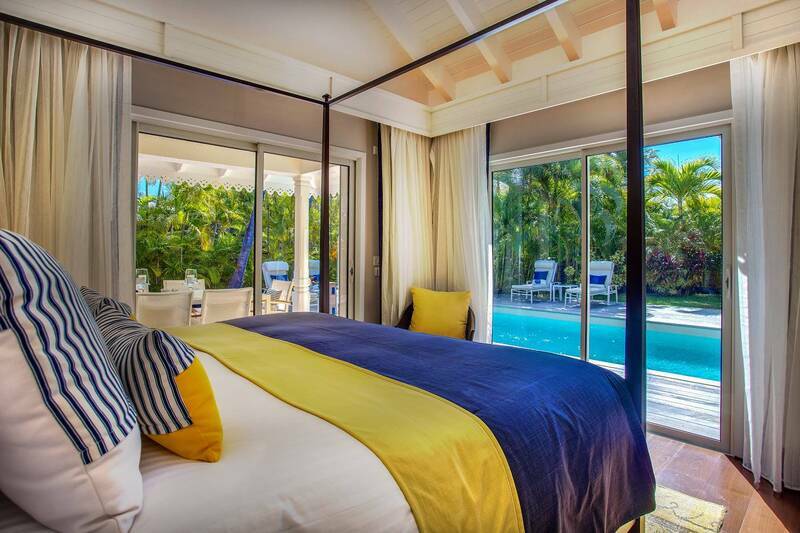 Bright and fresh, the two-bedroom Pelican Suite is situated in a garden-like setting overlooking Grand Cul-de-Sac. Decorated in the graceful Explorer style, the spacious ocean-view hideaway features a relaxing covered terrace with extended sundeck surrounded by a vast outdoor area with Jacuzzi,two entrances, a separate living room and elegant wood flooring throughout. The king-bedded master bedroom and twin-bedded second bedroom offer a bathroom with shower. (861 sq ft). 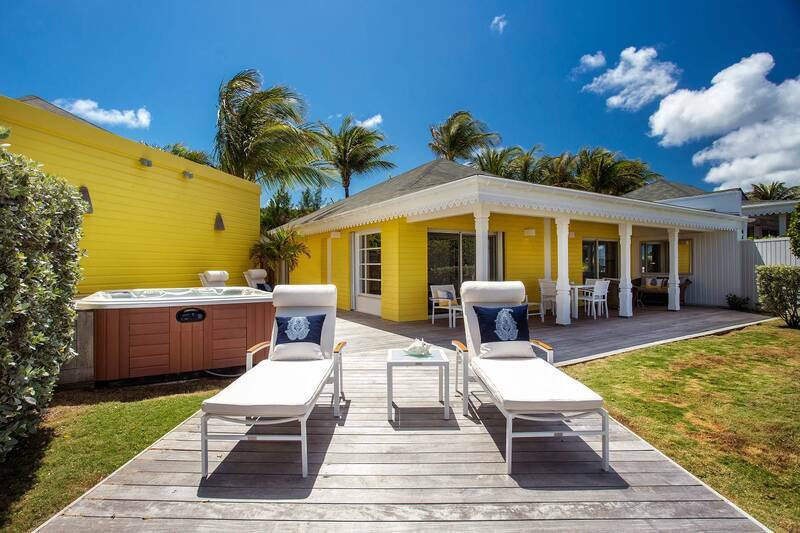 Located directly on the beach, the two-bedroom Beach House presents a relaxing private terrace in an intimate sand garden setting complete with private Jacuzzi. Decorated in the graceful Explorer style, the expansive suite features stone flooring and comprises an elegant living room, four-poster, king-bedded master bedroom with en-suite bathroom with shower, and second twin-bedded bedroom with separate bathroom with shower. (1001 sq ft). Located in the heart of the resort in a secluded garden setting, the three-bedroom Garden House is composed of three bedrooms surrounding a sparkling outdoor swimming pool. 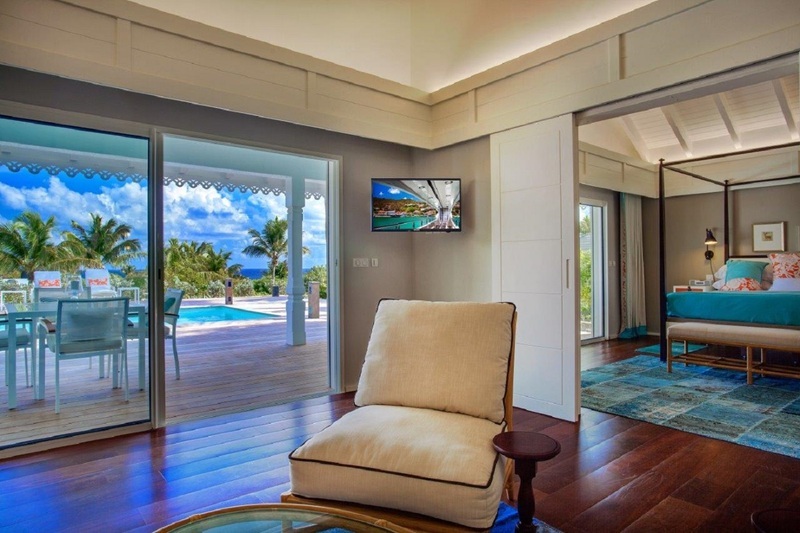 The king-bedded master suite offers a separate living room, while two connecting bedrooms upstairs overlook the pool from private terraces. Lovely views of the tropical surrounds are enjoyed from a spacious covered terrace with extended sundeck. Decorated in the graceful Explorer style, the suite also offers three entrances, wood flooring throughout, a convertible sofa in the living room and three bathrooms with showers. (928 sq ft). 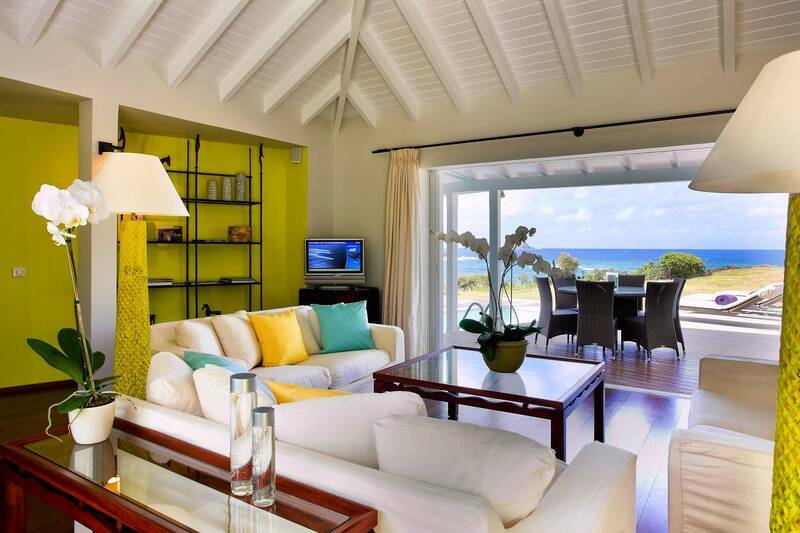 This colorful, thoughtfully appointed two-bedroom retreat offers ocean views across Marigot Bay and bold, Creole-influenced contemporary interiors. 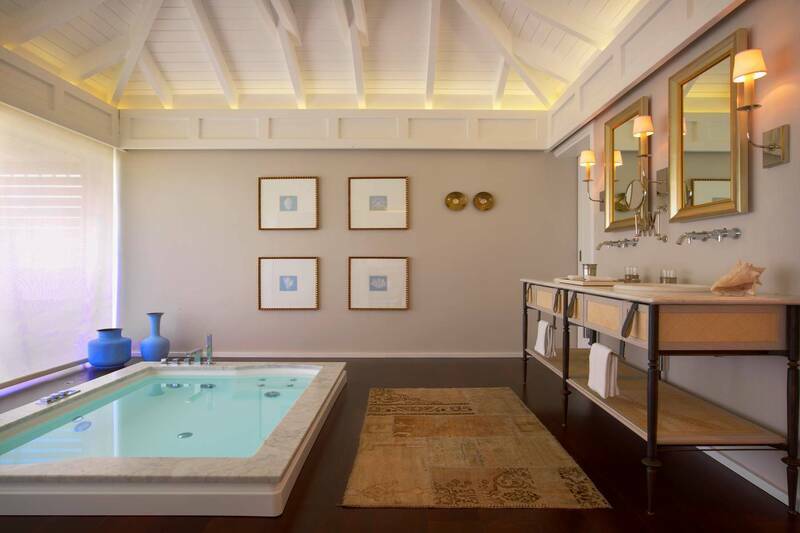 Located in a garden setting within the upper part of the resort, the Marigot Suite offers direct access to the spa and features two entrances, elegant wood flooring, a covered terrace with extended sundeck, large private pool and outside shower. 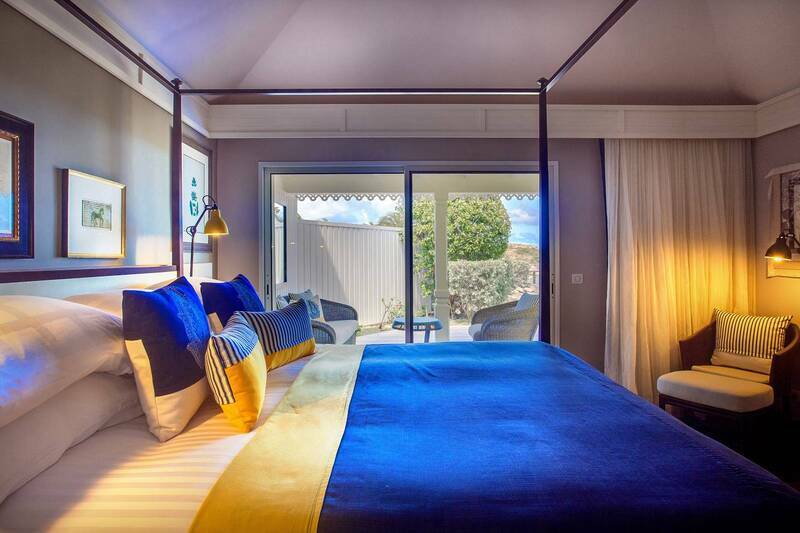 Both king bedded bedrooms are paired with en-suite bathrooms with showers. (1400 sq ft). 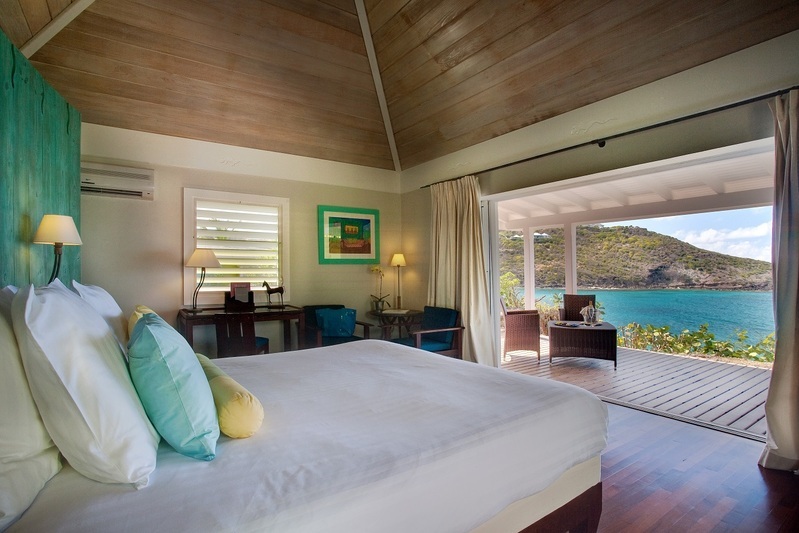 Calm and light, this suite takes its inspiration from the patina of St. Barth’s history. 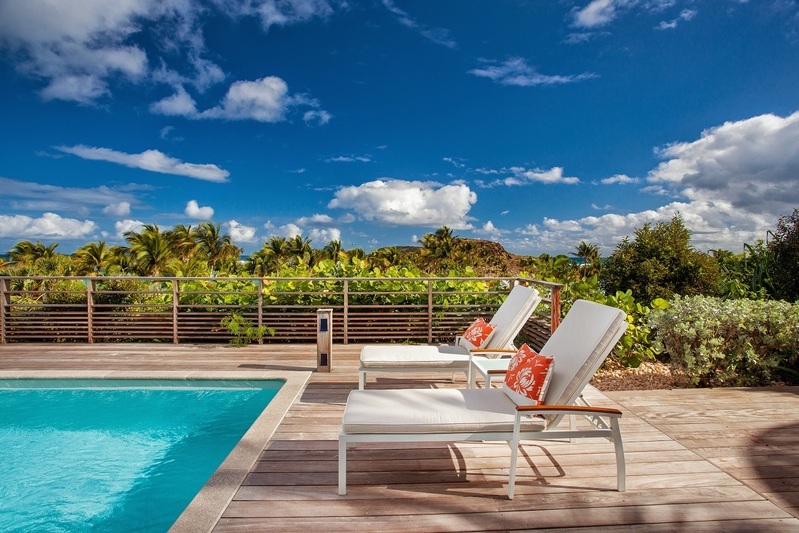 Nestled in the upper part of the hillside overlooking Grand Cul-de-Sac, the twobedroom Serenity Suite presents breathtaking views of the ocean from an expansive covered terrace with extended sundeck. A spacious living room is outfitted with a onvertible sofa bed, dining table and wet bar. The four-poster, king-bedded master bedroom offers a large dressing area and bathroom with shower and relaxing balneo tub, while the second bedroom features a bathroom with shower/hammam. 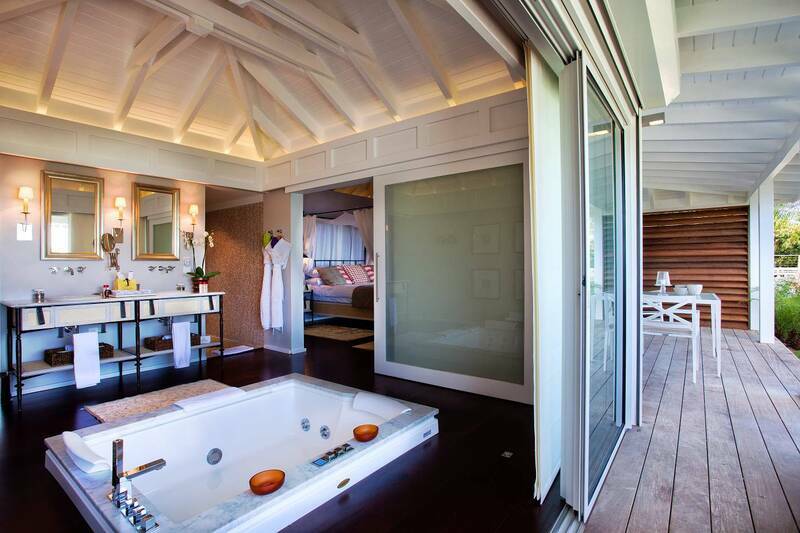 Two entrances provide access to the inviting, wood-floored suite which also includes a large private pool. (1506 sq ft). Dedicated to Christopher Columbus, who earned his admiralty on his second return from the Caribbean islands, this two-bedroom suite offers custom furnishings, wood flooring and stunning panoramic views of the sea looking out to Grand Cul-de-Sac. Accessed from two entrances, the luxurious retreat features a separate living area with a convertible sofa bed, a spacious master bedroom with four-poster, king-size bed and large dressing area, and bathroom with a shower and relaxing balneo tub. The second bedroom offers two twin beds. 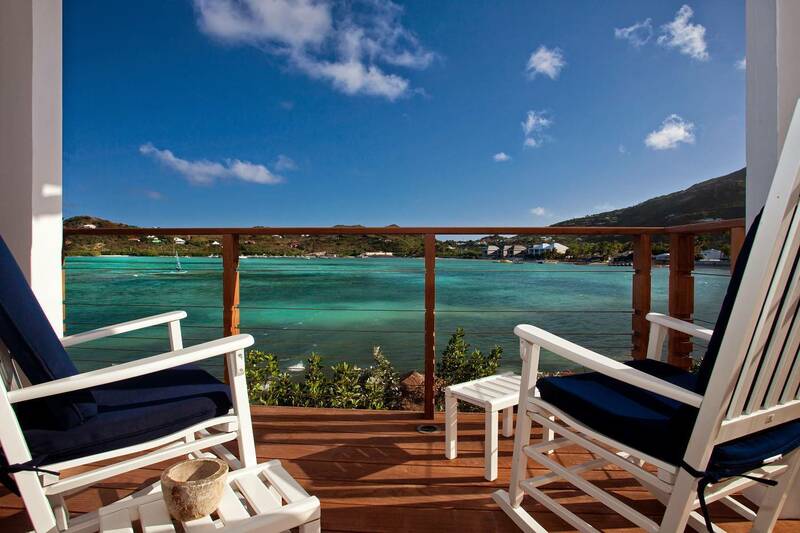 Surrounded by a private deck, the Admiral Suite also provides private access to the beach below. (1400 sq ft). Located in the heart of the resort, La Villa is an enchanting oasis that pairs the privacy of a secluded garden setting with convenient access to beachside activities and dining. 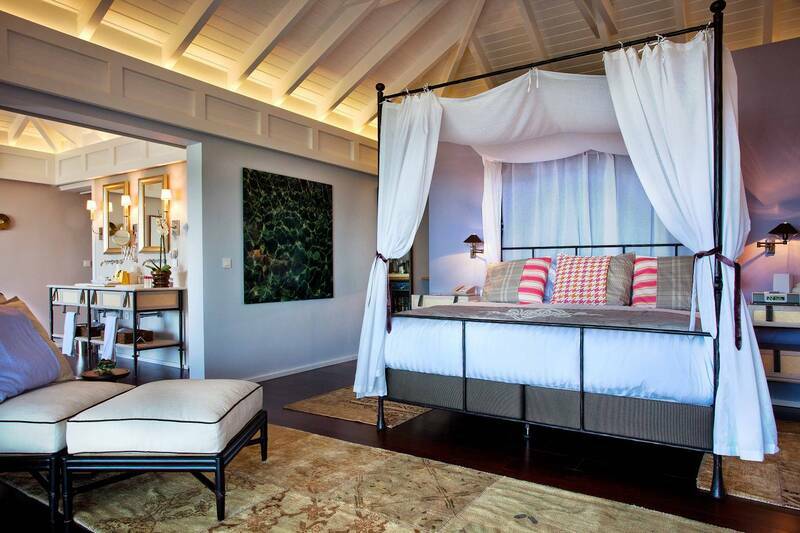 Fashioned in the graceful Explorer style, the three-bedroom suite features a separate living room with convertible sofa bed and an outstanding master bedroom with four-poster king-size bed, spacious dressing area and en-suite bathroom with shower and bath tub. The connecting rooms both have private bathrooms with showers. 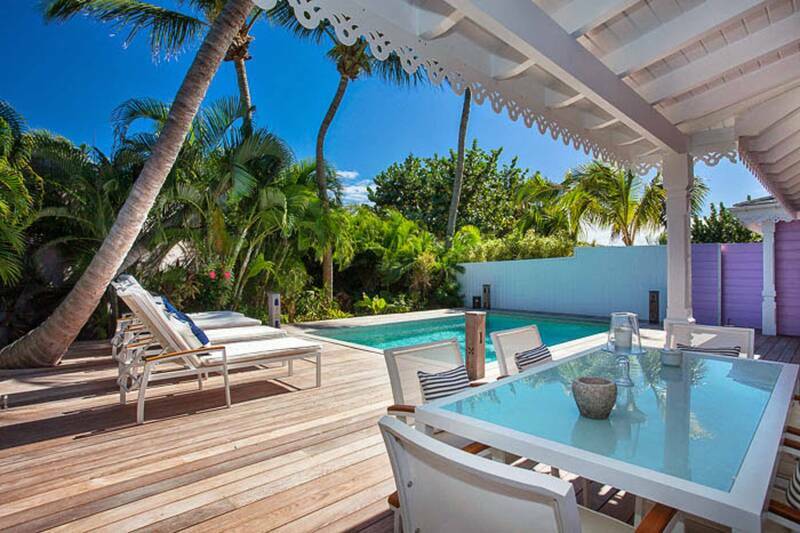 La Villa offers ocean and garden views, two entrances, wood floors throughout, a covered terrace with extended sundeck, and a private swimming pool. (1453 sq ft). For spa aficionados and any and all seeking a Safflower Fruit Salt Body Scrub or just a good old-fashioned Swedish massage, there is a full-service restorative Spa by Clarins. 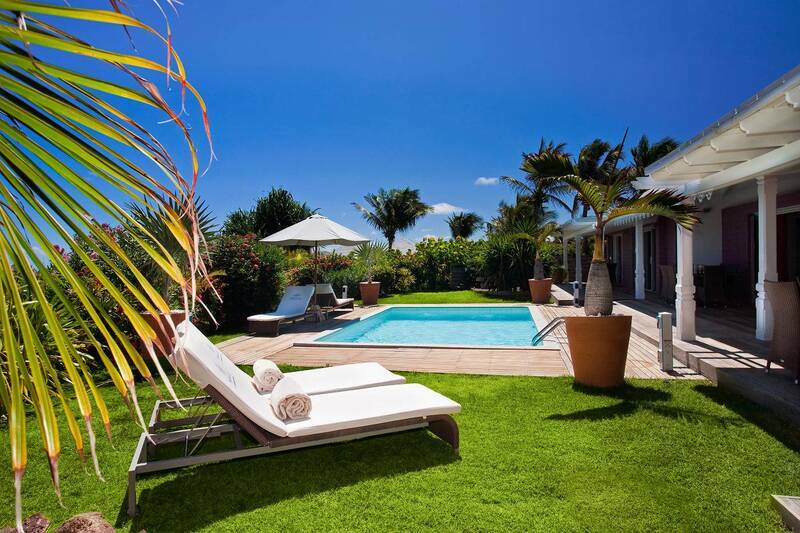 It’s as chic as the hotel with eight treatment rooms housed in thatched-roof bungalows and a beautiful, quiet pool. 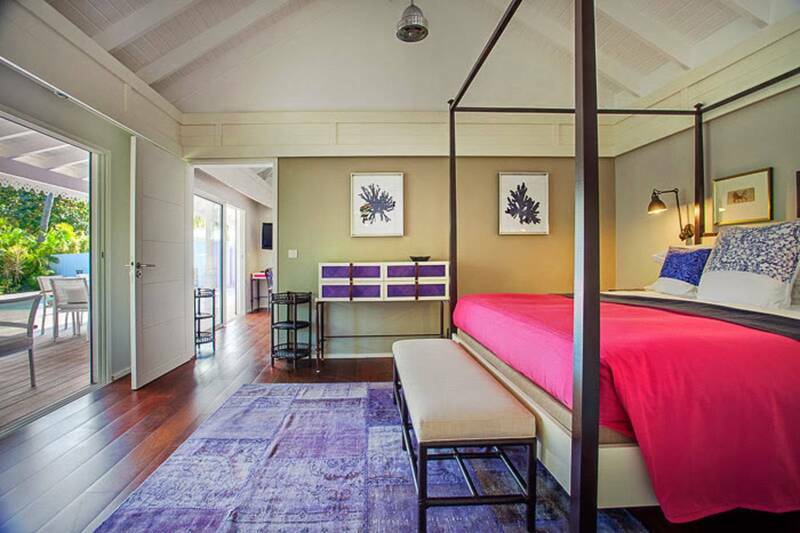 Staying in the Wellness or Marigot Suites gives you direct access. And it’s all in keeping with consummate service level offered by the gracious staff. All in all – idyllic. Dining options include the poolside L’Indigo; they serve a yummy buffet breakfast there each morning, and it’s a fun spot for lunch or a more casual dinner and L’Indigo On The Beach for those who want to lunch sans flip-flops. Make sure you make a reservation to dine at least one night at Bartolomeo: The cuisine is memorable and the garden setting is lovely. And one can choose to dine alfresco while listening to the gentle sound of rustling palm fronds. And there is the Beach Bar where the rosé is always chilled and expert mixologists are ready to shake, stir and serve your favorite cocktails. Apéritifs and digestifs are enjoyed at Bar ’to Lounge, the bar adjacent to Bartolomeo; it serves a selection of wines by the glass, liquors and cocktails. Santé. 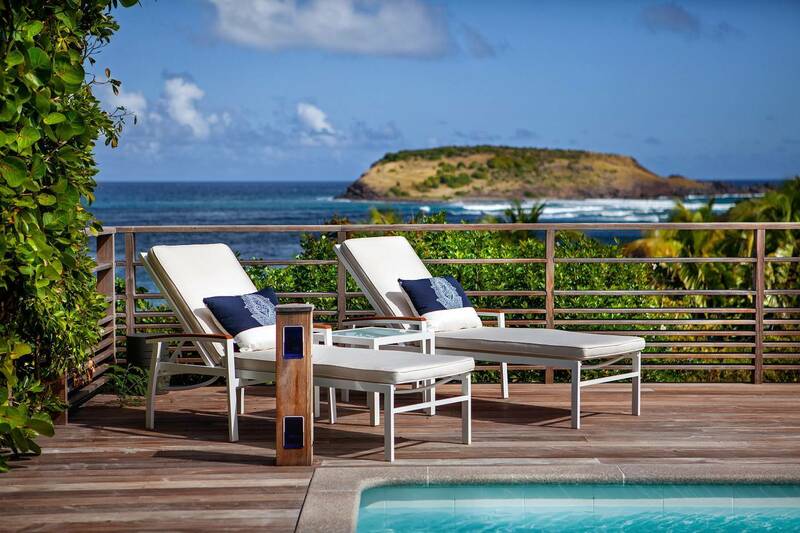 Your stay at Le Guanahani can be as action-packed or relaxing as you want it. 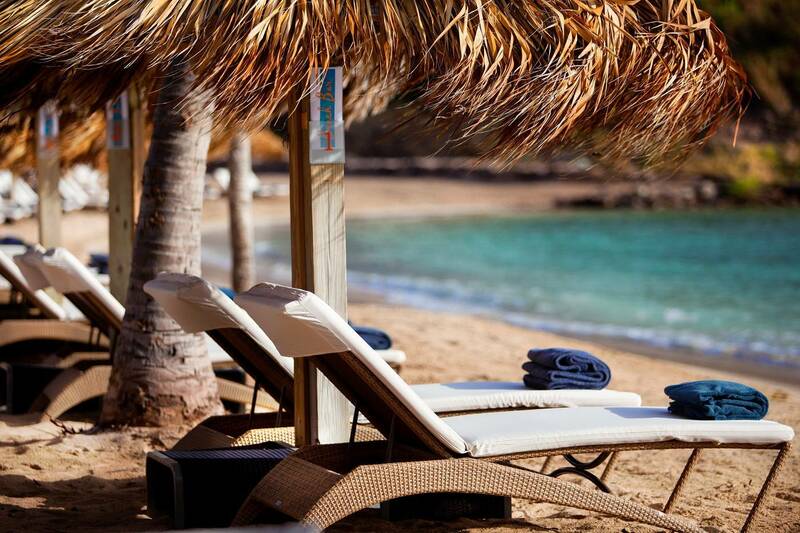 Relax on the beach or by the pool, enjoy a tennis game or water sports like wind-surfing and snorkeling. Off-site activities like scuba diving, sailing, deep-sea fishing and horseback riding can be arranged. And the island’s duty-free shopping is very popular. Le Guanahani offers a world of fun and entertainment for kids of all ages. The resort’s Kid’s Club is open daily from 9 a.m. to 5 p.m. Participation is complimentary for children between ages two and six years. Daily activities offer a taste of French culture through interactive engagements and games. A complimentary Juniors Club program, featuring indoor and outdoor activities, is offered daily from 9 a.m. to 5 p.m. for kids six to 12 years old. For both programs, reservations are required and lunch is offered at Indigo when accompanied by a counselor. Activities are adapted on a daily basis according to the ages, preferences and number of children attending. Counselors speak both French and English. Babysitting services can be arranged through the concierge with 24-hour notice. Two flood-lit tennis courts are available for use by up to four players each and can be reserved in advance. The upper tennis court is surfaced with agile turf, a sand-filled artificial grass. The lower court is surfaced with classic clay combining synthetic grass fibers and graded material infill. Tennis racquets and balls are provided. Lessons with a professional instructor are available by appointment. Le Gunahani offers a deep-sea Atlantic fishing excursion combined with a chef-prepared dinner. Guests head out on a morning fishing trip with an experienced, seventh-generation local fisherman and, when they return to the hotel, the day’s catch is prepared according to their preference—as ceviche, sashimi, tartare, tataki or simply grilled—as part of a three-course tasting menu lunch or a five-course tasting menu dinner. 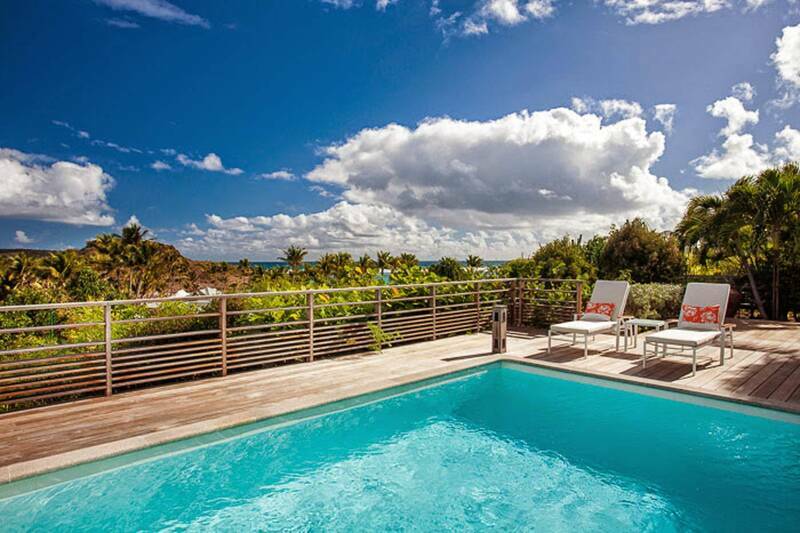 The Boutique offers stylish swimsuits, pareos, hats and Le Guanahani-branded resort wear as well as skin care and sundries. Open every day from 9:00 am to 5:00 pm. A concierge is available for restaurant recommendations and reservations, scheduling activities and lessons. Photocopying, faxing, printing and other services are available upon request.